Today, I'm going show you how to back up all of your apps and their data using Android Debug Bridge (ADB)—an essential function for all softModders. These commands will be especially useful when you are updating your version of Android, since they don't require a third-party program to run on your device. Unlike other third-party solutions, this method does not require root and allows you to back up all your data directly to your computer. You could also use Google's normal cloud backup service, but I have found that it doesn't restore game saves (unless it uses Play Games) or app data/preferences that are not distributed by Google. Create a new folder on your desktop (I named mine "HTCOne" for this tutorial). Also, be sure to install ADB on your Mac. You'll also need to have "USB debugging" enabled for both of these operations. In no time at all, all your apps and their data will be backed up. 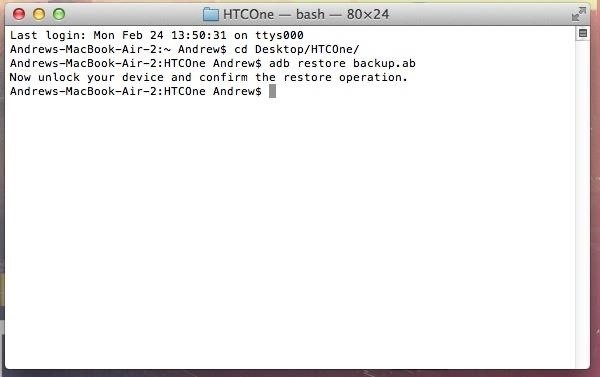 With your HTC One connected to your computer, go ahead and do the following to create a backup. Type cd Desktop/HTCOne and hit the Return key. This will signify your folder as the place to drop your backup in. Replace "HTCOne" with whatever you named your folder, if different than mine. 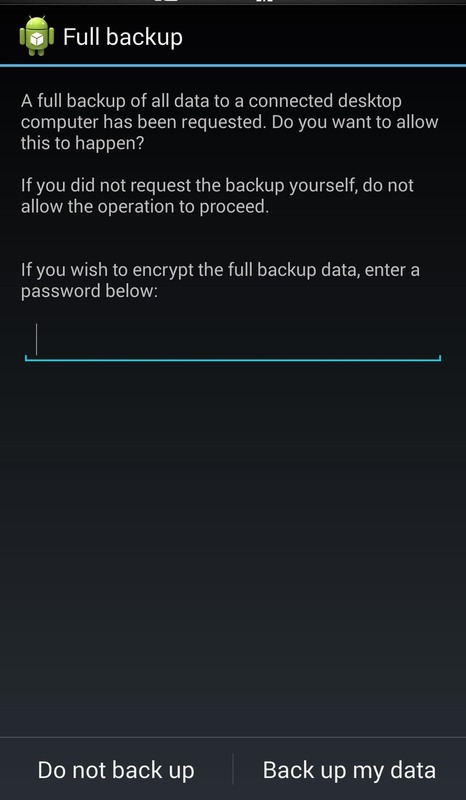 Type adb backup -apk -all -f backup.ab and hit Return. This is the adb backup command. Now go to your phone and tap Back up my data to send the file to the folder on your desktop. 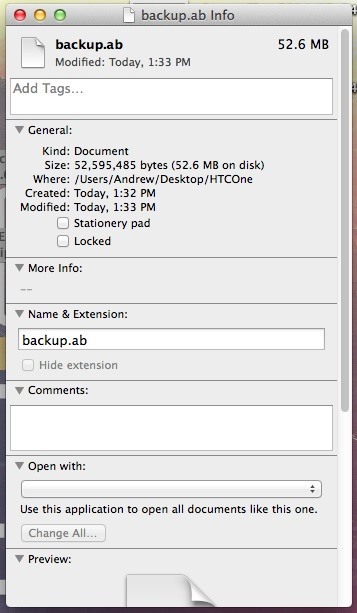 Wait for the process to complete and now your backup (named "backup.ab") will be placed in your HTCOne folder on your desktop. Just as easy as backing our apps up, we can restore them in no time. Type cd Desktop/HTCOne and hit Return. This will let the next command know this is where the file is. 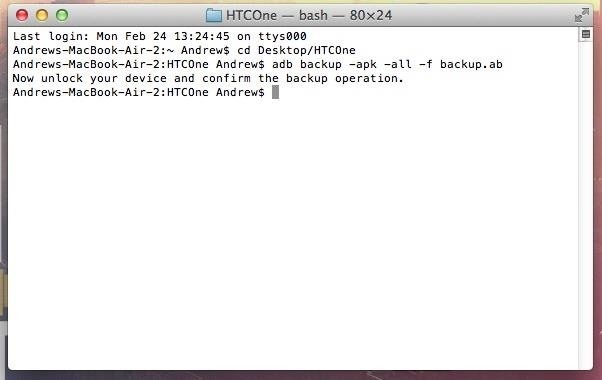 Again, change "HTCOne" to the name of the folder containing your backup.ab file. Type adb restore backup.ab and hit Return. Go to your phone and select Restore my data and allow the process to complete. All your apps and their data should be restored to you phone. Enjoy! Unfortunately not. You would have to use a back up app like Helium to do that. When i use the command my phone prompted to the Full restore but the "restore my data" and "do not restore" are both gray. how can i fix this?please help me. At the first try, they are both white but when i press "restore my data, it didnt do anything so i thought it was frozen because the backup.ab file was too big (like 1gb,) so i pressed do not restore . When i tried another time, they are both un-clickable state. What are the details of your phone ROM?/Android Version?/S-Off?/Rooted? i have no idea what ROM i am using now because i have just followed the intrusion to root my HTC ( 4.4.2 kitkat). and i don't know about the S-off that you mentioned. Sorry i am just a newbie in rooting Anroid. :((. So how can you identify all that information ? So you were using a completely stock One and you just rooted right? Hi, I am following all the steps and it says command not found. That means you do not have adb installed. Are you using windows or mac? You have to enter these commands while booted into regular sense. You cannot use adb commands from fastboot mode. whats the name of your case. i simply love it. Its the Double Dip Case from HTC. Hi, I have done the tutorial about installing ADB and Fastboot and Terminal informed me that I am now ready to do fast boot and adb, but I still get a message command not found, when I use the code above. Extract the zip one more time and manually move the fastboot and ADB commands to /usr/bin/. Safari unzips the file by itself, and I have tried moving them manuelly to /usr/bin but I still get the same result. Try using a different USB port and make sure to accept the RSA key after enabling USB DEBUGGING. Thank you very much!! It was done with changing the USB port :) your tips are great! Thanks, glad I could help! Did you authorize the copy when moving the files over to /usr/bin and restart terminal? Use this XDA thread to install ADB on Windows. I'm stuck at step 3 of backing up. I have already downloaded all the prerequisites like android sdk and the adb and fastboot but when I input the backup command, it says that the command is not found. Help..? If you are using Windows make sure you are running the commands from your ADB folder. You could also use this tool to install the commands system wide so you do not have to worry about what location you are running the commands from. Hei I am using windows and it shows error:device not found adb: unable to connect for bakcup. what should i do now? Have you enabled USB Debugging and installed the HTC drivers through HTC Sync? When I was backing up my HTC One m8, it would say that the system ui stopped responding. It would bring me to the lock screen and when I unlocked it, it was still be backing up data. Is this anything to be worried about? There should be nothing wrong, but just to be safe you might want to make another. Thanks for your wonderful guides! I made it through all your steps to root my phone which was a success but now i'm hung up on the final step of restoring. I backed up my phone to my computer, in the HTCOne folder which contains a 27.7mb file labeled backup.ab . Now when I try to restore it, I run the adb restore backup.ab command and it says it has restored but when I check my phone, nothing is there. What do I do ? What exactly are you missing? That back up method is mainly for settings and app data. I was missing all my apps and some basic settings like Blinkfeed but I solved this problem by going to the app store and redownloading them. Also, after redownloading, I tried to open my HTC notes app to read my old notes but it said "sorry this not is broken, You are not able to open this note" . Can you help me? Check out this XDA guide on how to fix it. Sorry to keep bothering you, I really appreciate your help but I tried that guide and there was nothing in the .data folder (I'm guessing the files are hidden). Any advice on this? Which file explorer are you using? HTC Manager wouldn't show hidden files. You'd to use windows explorer or any root file explorer on your phone to see them. I'm rooting the phone so that I can use a separate program to recover deleted text messages. Do I need to do some sort of separate back up to make sure this data that I want to recover is not lost in the root process? Your entire device will be completely wiped when you unlock the bootloader, so that data will be lost in the process.